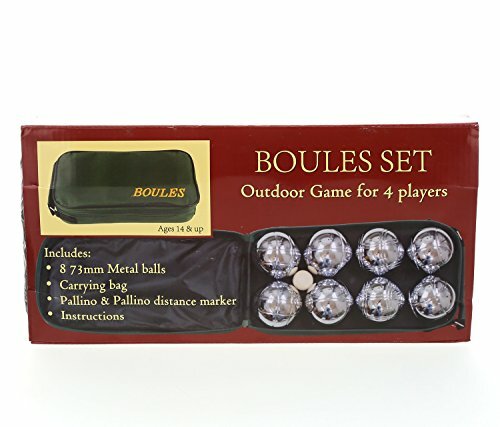 Mozlly Multipack - Classic Game 8 Ball Bocce Set with Canvas Storage Bag - 73mm Regulation Size - Petanque Game (Pack of 3) - Item #S119029_X3 by Mozlly at Scruffs Game. MPN: S119029_X3. Hurry! Limited time offer. Offer valid only while supplies last. Head outside and enjoy a game of Bocce with this 8 ball set! Made of polished metal and are 73mm regulation size. Perfect to play on dirt or grass. Head outside and enjoy a game of Bocce with this 8 ball set! Made of polished metal and are 73mm regulation size. Perfect to play on dirt or grass. The carrying case makes it compact and easy to carry! Includes a canvas carrying case with handle, target ball & distance marker for accurate results. Head outside & enjoy a fun game of Bocce with this 8 ball set made of polished metal! Perfect for experienced & new players of Bocce. Also suitable for Petanque. Bocce balls are made of polished metal & feature 4 different striped patterns. Regulation size & includes a measuring marker for accurate results.